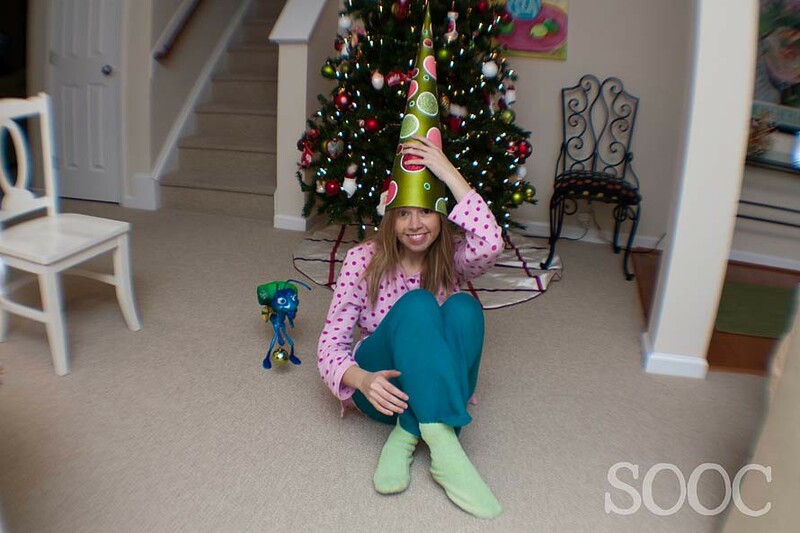 Remember that Christmas tree cone I shared the other week…the one I said looked like it could be a dunce cap? 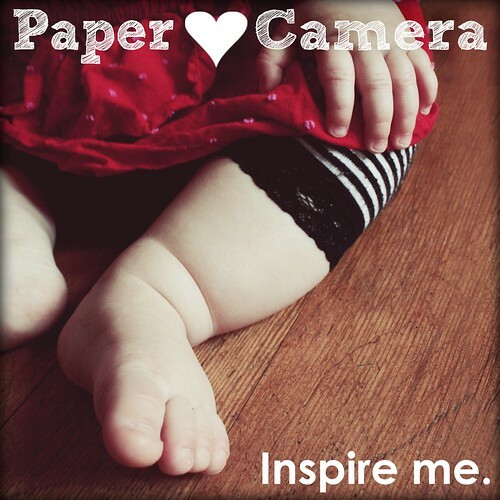 Well, I decided for this week’s Paper Heart Camera – Self-Portrait challenge, that I would use it. 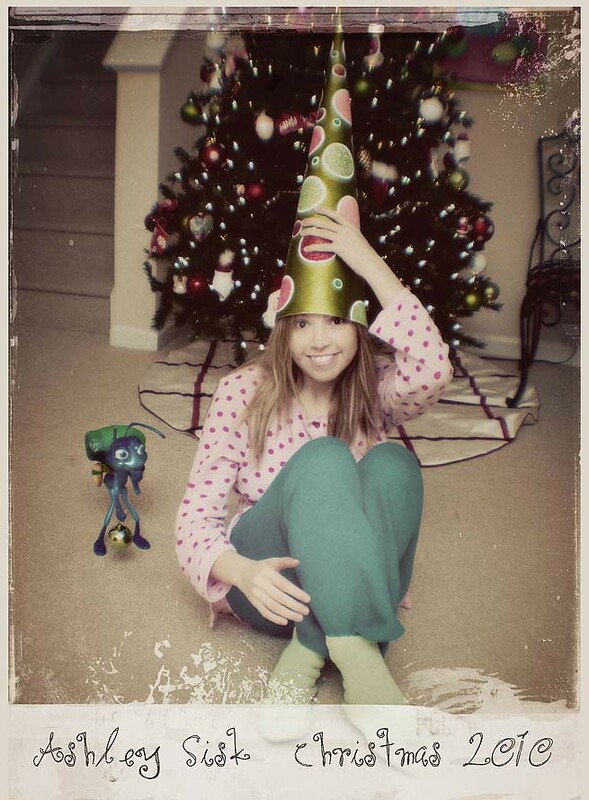 In addition to the dunce cap, I thought I’d wear what my husband calls, “my Christmas elf costume.” It’s not a costume at all, but my favorite pajamas…at least right now. Top = a pajama shirt my mom gave me; Bottom = sweatpants from Walmart ($5 – accidently purchased the petite length and then my husband accidentally struck them); Socks = from my drawer…clearly, they are worn better if you tuck your pants into them. Aputure Wireless Remote Trigger (apparently it won’t work on my 7D – gotta find another one…and the whole trigger thing wasn’t working right either…I DO NOT recommend). 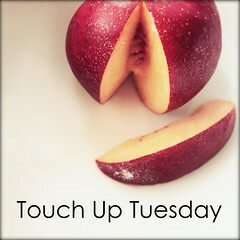 For me, I have to use manual focus to set up the shot before I can press the button and run into the frame. It took several Speedy Gonzales moves before I got it right. 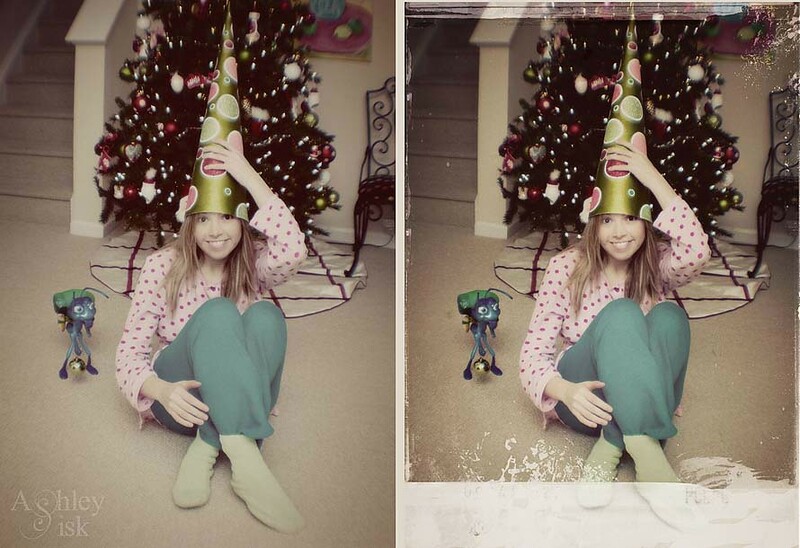 I didn’t bother to remove stuff from the background…my attempt at keeping it real. Notice Mr. Flick? In post-processing, I corrected my white balance in Adobe Camera Raw. I then brought the photo over to Photoshop Elements 7 and ran a clean edit followed by Coffeeshop’s Baby PowderRoom to gently clean up my face (give me a break…this is after a long day at work). At this point, I decided that vintage would suite this photo well and applied Pioneer Woman’s 70’s action. I turned the opacity down to 40% (sometimes I think it’s a little too heavy). I then used Pioneer Woman’s Vintage action on top of the 70’s action. I adjusted the layers by turning the 70’s copy layer down to 40%, the vintage layer down to 40% and the top layer down to 20% opacity. Those layers were then merged. I don’t own a Polaroid, but I do love the effect. I found four great Grungaroid textures by Shadowhouse Creations a while ago…I’d forgotten about them until the other day, so I decided to try them out on this photo. These textures are applied like any other texture. Just drag, drop, select a blending mode, select an opacity…and then use layer masks to remove texture where needed. After layering textures and making small adjustments to suite my tastes, I added just a little more canvas (go to Image>Resize>Canvas), added some text and resized/sharpened. What do you think – another Ashley Sisk original? With all that said, I hope everyone had a Very Merry Christmas!